UNITED NATIONS, Jun 28 2014 (IPS) - The United States and the 28-member European Union (EU) have assiduously promoted – and vigourously preached – one of the basic tenets of Western multi-party democracy: majority rules. But at the United Nations, the 29 member states have frequently abandoned that principle when it insists on “consensus” on crucial decisions relating to the U.N. budget – or when it is clearly outvoted in the 193-member General Assembly or its committee rooms. That’s exactly what happened Thursday at the U.N. Human Rights Council (UNHRC) in Geneva which adopted, by majority vote, a proposal to negotiate a legally-binding treaty to prevent human rights abuses by transnational corporations (TNCs) and the world’s business conglomerates. But following the vote, the United States and the EU, have warned they would not cooperate with an intergovernmental working group (IGWG) which is to be established to lay down ground rules for negotiating the proposed treaty. There are also a host of practical questions about how an internationally binding instrument would apply to corporations, which are not subjects of international law, and how states would implement such an instrument, said Townley, special assistant to the legal adviser at the U.S. State Department. The vote was 20 for, 14 against and 13 abstentions in the 47-member HRC. The United States and EU members, including France, Germany, UK, Italy, Ireland, Austria, Estonia and the Czech Republic, along with South Korea and Japan, voted against the resolution. Spearheaded by Ecuador and South Africa, the resolution received positive votes from China, India, Indonesia, Kenya, Pakistan, Philippines and Algeria, amongst others. The Arab nations, including Saudi Arabia, the United Arab Emirates and Kuwait, along with Mexico, Peru and the Maldives, abstained. Anne van Schaik, accountable finance campaigner with Friends of the Earth Europe, told IPS the voting list “makes clear we are up against powerful forces”. “Who will not back away from using old bullying techniques?” she asked. She said the EU has clearly stated it will not cooperate in implementing the proposal. And after the vote, the United States said this legally binding instrument will not be binding for those who vote against it. “So we can expect some fierce opposition,” Schaik said, even as the IGWG plans to hold its first meeting sometime next year. “But we are cheerful because it is not every day public interest wins over corporate interests which are backed by the EU and the U.S.,” she added. 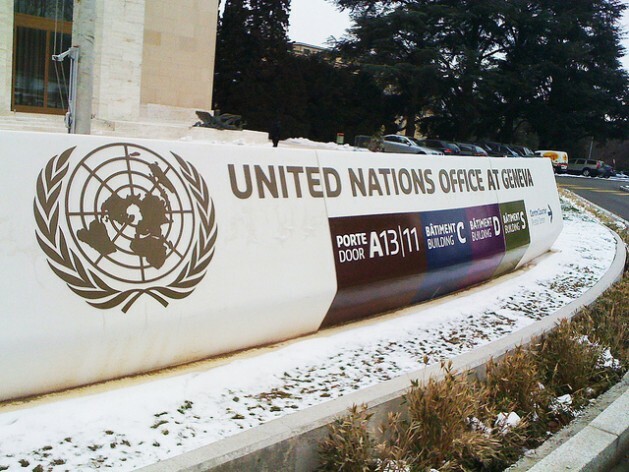 Both United States and the EU have argued that the three-year-old U.N. Guiding Principles on Business and Human Rights is adequate as a yardstick to monitor the business practices – and malpractices – of corporations and big business. “We have not given states adequate time and space to implement the Guiding Principles,” Townley told delegates. Philip Lynch, director of International Service for Human Rights, told IPS that in order to be effective, it is crucial that any treaty on business and human rights be negotiated with input from all relevant stakeholders and that it cover all business enterprises, not just transnational corporations. “We consider it very important that the European Union participates in this negotiation process,” he said, since the EU is both the headquarters for many corporations, and global leaders in the implementation of the U.N. Guiding Principles on Business and Human Rights. “We also hope that the negotiation of the treaty can complement and build on the consensus underpinning the Guiding Principles, which enjoy strong EU support,” he added. Speaking of the proposed treaty, Schaik told IPS this is something that Friends of the Earth has campaigned for years, if not decades. So, it is better than, for example, having legislation adopted by some countries, or regional bodies (if this would have been feasible at all), she added. Secondly, Schaik said, what is very positive as well is that in the resolution, a roadmap is already laid out for the first steps of this working group. “The division of the votes clearly shows that the countries who are host to a lot of TNCs, such as the EU, as well as Norway and the U.S., are against this proposal,” she noted. Asked how the Western opposition could be countered, she pointed out the U.S. warned, even before the vote, that countries who voted against it would not be obliged to respect the resolution. She said the treaty alliance is already making plans on how to follow up on this victory, “and I think particularly for groups in Europe, the U.S. and Norway there is an important task to keep pressuring their countries to respect the resolution. “We will campaign, set up email actions, present research, organise speaker tours and take to the streets, if necessary, to ensure the working group will be successful,” she said.